Our days in the UK are counted. 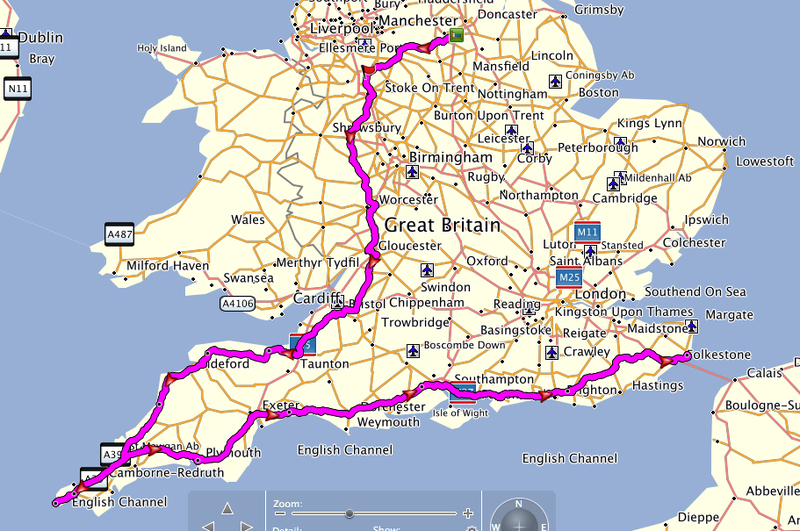 We will ride from Sheffield towards Cornwall and continue to Dover - a little less than 1000miles. We welcome you to give us some tips on nature attractions (no city stuff please) as well as raw-food places and low budget (dog-friendly) accommodations. Stonehenge and the Beaulieu National Motor Museum are already on our list. The picture shows our approximate route. Cornwall, absolutely. But reading on line one I notice you got that figured out already. Doc Martin. Poirot. But Why not Wales?